One World Futbol makes an unpoppable soccer ball. You can try to pop it! You can squash the air right out of it, but it just fills back up. You’ve probably seen pictures of kids in refugee camps or slums receiving soccer balls as gifts. But what happens when the balls pop? Those children don’t have lush soccer fields to play on. They play right in the road. What happens when they kick the ball into a barbed-wire fence? Or into some thorn bushes? Even if they avoid those scenarios, the ball skids over the rocks in the road. Eventually it tears a hole and pops, or a stray dog gets hold of it and bites through it. The One World Futbol is immune to all that damage. You can kick it into a barbed-wire fence and go right on playing. I saw someone slash right through the middle of one with a knife and it still held its form. They tested it by giving one to a German shepherd for a year and the dog couldn’t pop it. I gave one to my dog, and she gave up trying because she just couldn’t do it. And then I drove over it in my truck! It popped right back up and filled with air again. Check out how happy this little girl is! 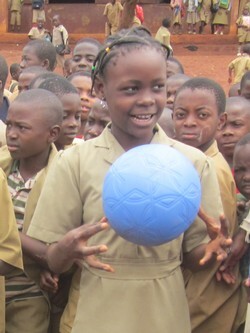 Her school in Cameroun has just received its One World Futbol. It’s a ball that can’t pop! What could possibly destroy this ball? Nothing! The only way to destroy it is to tear it into a bunch of pieces, which kids wouldn’t do. It’s amazing! It won’t always be perfectly round. It’s pretty much round, but it can get a little off. The ball I have is a little bit more off than usual because I drove over it in my truck. But you know nothing’s going to be perfect in this scenario. You see kids wrap trash bags up into a ball and kick that around. That’s their concept of a soccer ball. Who needs perfection? Give a ball to kids in poorer areas, within the US or abroad, and help them play. It gets their minds ticking. It gets their competitive juices flowing. They learn to have fun again. And I think that reestablishes their ability to dream. I think all dreams start when you’re small, and a lot of the kids we help have been trafficked. Their dreams are killed, or they’re emotionally just destroyed from the trafficking issues. So creating the opportunity to help them play is awesome. They learn to have fun, rather than living in fear. Play can reestablish the creative side of the minds of these kids that were trafficked. I think that is what Jesus would do. When He was here, when He walked the earth, I think He would have tried to figure out how to get these soccer balls into kids’ hands. Because they don’t pop. Yes, I said it! Jesus Himself would work to distribute these balls. He would love them because they don’t pop. Want to know more about that? See you next week. This entry was posted in Discipleship, Dreams, Generation Alive, Slavery and tagged Generation Alive, Human Trafficking, One World Football, soccer. Bookmark the permalink. You have such a great heart. I love how you address simple things (like providing a child with a soccer ball) and show how having the right resources and helping out our communities can really enlighten us all. 🙂 And also…an unpoppable soccer ball sounds like the most ingenious invention ever, especially for kids! This is amazing, I saw this on PBS socal. What an awsome product!